Kitchen sinks always seem to clog at the worst times. Either when you’re cleaning up from a large family meal or when you have guests. Sometimes the clog is caused by excess food stuck in the drain and can easily be removed with your fingers. Other times, the clog is farther in the pipe past the point where it can easily be reached or plunged. It’s easy to call a drain cleaning company in Escondido to clear a clogged kitchen sink, but what if you could avoid the time and expense of doing this? Here are a couple of tips to help you keep your kitchen sink clear and ready to work at a moment’s notice. Trash never belongs in the kitchen sink. Packaging and food scraps should always be thrown directly in the trash. It’s tempting to use the sink as a temporary trash can while you’re cooking dinner, but it’s easy for non-organic substances to fall into the drain without your knowledge and become lodged. If you don’t like to walk back and forth to your trash can, consider a trash bowl to store your scraps and packaging in to throw away all at once. Cooking oil, grease, and fat from cooked foods should be disposed of in other ways than rinsing them down the sink. These substances can harden and coat the inside of the drain pipes. The sink may not clog right away, yet over time you will start to experience problems. If your sink does become clogged, as your local drain cleaning company in Escondido, we can help you. Hydro jet drain cleaning and drain camera inspection are the tools of the trade we use to locate and clear the toughest drains – guaranteed! Do You Know the Warning Signs of a Main Line Clog? Are you concerned that you may have a main line clog in your home? 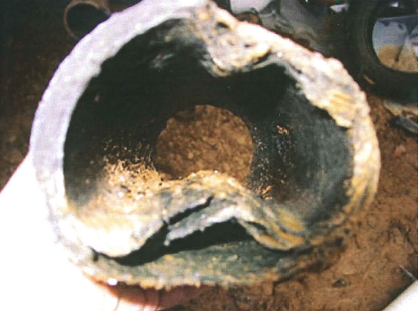 Years of plumbing usage can cause debris to collect inside the sewer line. Also, if you have an older home, the main line could have collapsed from age, corrosion, or even mature tree roots that have grown into the side of the pipe. All of these circumstances can make it difficult for water and waste to move through resulting in a very messy situation. When one of these kinds of clogs go unnoticed, it’s possible that raw sewage could flood your house or yard. That’s why it’s important that you know the warning signs of a main line clog. Clogs that are located in secondary lines won’t affect other drains in the house. The obstruction is only going to affect how the sinks connected to that pipe. With a main line clog, you’ll experience bubbling or backups in drains throughout the house. For example, when you drain the bathtub, the toilet may gurgle. This is a big indicator that you have a main line clog. Raw sewage should never make its way back into your home. The sewer line is designed to direct waste from the home and never come in contact with clean water. At the first sign of a main line clog, you need to call a plumber for inspection, diagnosis, and possible sewer drain cleaning. 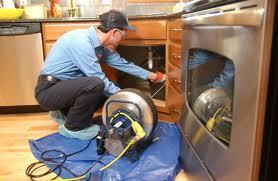 A licensed plumber will examine the situation and provide you with your cleaning or repair options. At Escondido Plumbing Whiz, we recommend regular drain cleaning and inspection services to catch clogs in their earliest stages to prevent big problems. How often you need drain cleaning depends on my factors and should be discussed with your plumber. Do You Know Where Your Building’s Sewer Line Is Located? One of the trickiest aspects of sewer line repair is that it involves dealing with plumbing systems that we cannot see. 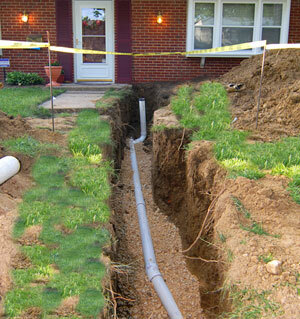 Many homeowners do not know much about the location of their sewer system outside the house. However, Escondido Plumbing Whiz can help you locate your sewer system so that you can understand where to look when there is a sewer line problem. We have many years of experience in plumbing repair and have the knowledge and experience to handle any type of sewer line problem. Our company not only provides sewer line repair services, but it also provides clients with recommendations for the best plumbing systems to use and advice on sewer line maintenance. Here are useful tips for locating where your home’s or business’s sewer line is located. Obtain copies of your building permits from the city planning offices. You will find a rough drawing of your home, details of your lot, and the exact location of the sewer pipes from your home to the city sewer system in one of the documents attached to the permit. You may be required to pay a small fee to obtain these details from the city planning office. Use the rough drawing to determine the approximate location of your sewer pipes. If you are unable to obtain copies of the permits or cannot comprehend the rough drawings, hire Escondido Plumbing Whiz to help you locate the sewer pipes buried under your lawn or home. We will start by locating the sewer cleanout valve, which is normally located near the bathroom, close to the outer walls of the house. Our technicians will use a pipe wrench to remove the lid of the sewer and then use a device known as plumbing snake to map out your plumbing system. We may also use video plumbing to help locate the sewer lines placed outside your home. The video plumbing device will provide a video feed for your sewer lines. It is advisable to know the location of the plumbing systems outside your house to make it easier for you to determine problems with your plumbing system. Schedule an appointment with one of our qualified Escondido plumbers to help you locate your sewer lines.